Alligator Pools of Naples, Inc., offers pool cleaning and maintenance services. Let us save you money on pool maintenance costs. Keep your pool healthy and safe for friends and family. Alligator Pools of Naples is the premier solution for all of your pool maintenance needs. 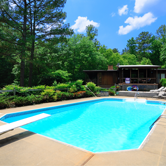 We specialize in residential pool service and offer a variety of maintenance plans with our weekly service agreements. We provide consultations to arrange weekly service according to your needs. We service indoor and outdoor pools and large commercial water fountains. Request pool service and maintenance today.